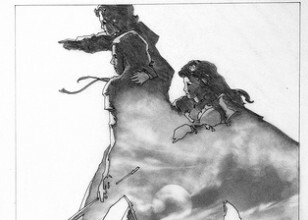 John Alvin, who became a close friend of ours, is one of the most prolific and well known of all the cinema artists in history, and belongs in the tiny list of important artists which includes Drew Struzan, Richard Amsel, Bob Peak, and Saul Bass. We are honored to represent the original art of John Alvin, and hope his true fans, new fans, or those who know his very important place in film history will be the ones who will get these wonderful originals. 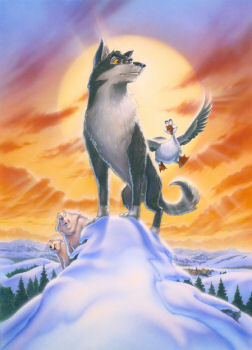 This Balto presentation composition is an original mixed media piece that is signed by John Alvin, whose artwork is skyrocketing in popularity and interest due to the release of The Art of John Alvin book. Order your copy of the book here. Now is the perfect time to begin or expand your collection of John Alvin's work before everyone else takes the art you want! John Alvin, who became a close friend of ours, is one of the most prolific and well known of all the cinema artists in history. We are honored to represent the original art of John Alvin, and hope his true fans, new fans, or those who know his very important place in film history will be the ones who will get these incredible originals. They all come with certificates from his estate. Please call with any questions. To view more of John's amazing work, please visit The Art of John Alvin our website dedicated to a great friend, his work, and importance to the world of film art.